Following the success of Netflix's ventures into the Marvel Cinematic Universe with Daredevil and Jessica Jones, the upcoming Luke Cage already has fans primed with anticipation. Netflix have delivered a somewhat grittier treatment of their Hell's Kitchen superheroes in comparison to their flashier Avengers counterparts, grounding these characters with the harsher realities of a crime fighting existence - and tackling real world issues such as sexual abuse and political corruption. Audiences have already been introduced to Luke Cage (Mike Colter) through the lens of his tough cookie comrade Jessica Jones (Krysten Ritter), but his solo series will give him a new platform to expand from - exploring his origin story and greater personal motivations, in the process. Colter has shared his take on his complex role, his responsibility to the significant existing fan base, and how the story relates to this modernized setting. “I think what I’m excited about is the chance for fans to see this character that they’ve been waiting for. I’ve met so many fans along the way, over the past few months, over the past year, and their excitement has kind of been intoxicating. It spreads, and it’s one of those things that before I started the project, I felt like I really wanted to do this character justice and I would enjoying playing this character and trying to figure out who he was, but now, I feel [a weight] in a sense that the fans have so many thoughts and expectations. “I think what I am specifically and uniquely able to bring to this character is the fact that I do look through the world with a global lens and I don’t really think about everything as black and white. When I approach this work, I look at it from the responsibility of an actor who’s trying to bring the nuanced character to form and what I think that makes it unique is the character is black but at the same time, that doesn’t define who he is. When he is thrust into the main stage, he’s not really ready for that. Luke Cage's Blaxploitation origins need not be a primary focus of the character in today's world, but as an African American superhero, there is a probably a responsibility felt by the creators to explore how the character will inevitably be affected by the inequalities that do still exist today. Cage's origin story involves exploitation by law enforcement, which is a timely reference to current issues and events that would be out of character for Netflix to ignore - with their reputation of fearlessly exploring difficult and challenging subject matter. Recent set photos certainly hint that this could be the case. 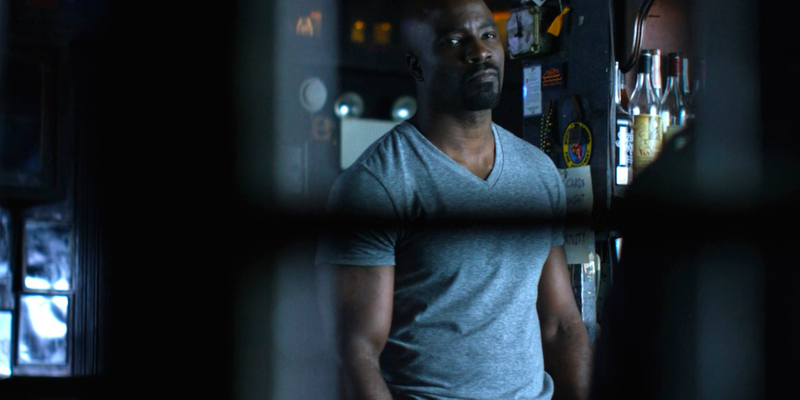 Sociopolitical elements aside, Colter's insightful views towards Luke Cage are a positive sign that the TV show will portray another intricate and complicated superhero with a thought-provoking story arc. That's everything we are all hoping the upcoming Netflix series and its showrunner, Cheo Hodari Coker (Southland, Ray Donovan) will deliver, along with the introduction of even more interesting Marvel comic book characters who are new to the small screen. Joining Mike Colter in the Luke Cage cast are Mahershala Ali (The Hunger Games: Mockingjay - Part 1 & 2), Alfre Woodard (12 Years A Slave), Simone Missick (Ray Donovan), Theo Rossi (Sons Of Anarchy) and Frank Whaley (Ray Donovan). Rosario Dawson will also be reprising her role as Claire Temple from both Daredevil and Jessica Jones. Daredevil season 1 and Jessica Jones season 1 are currently available on Netflix. Daredevil season 2 will debut on Netflix on March 18th, 2016, followed by Luke Cage season 1 later in 2016. Release dates for Iron Fist and The Defenders on Netflix have not yet been announced. Screen Rant will keep you updated on the Punisher spinoff as development continues.